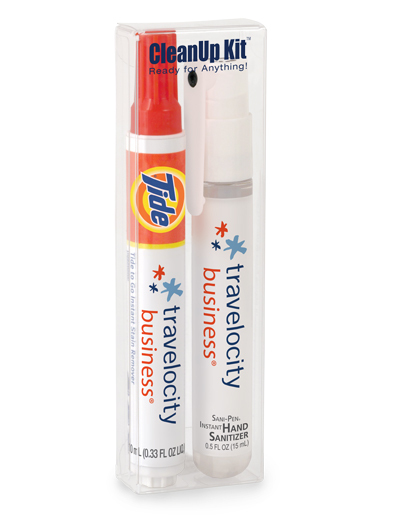 Be ready for anything with Tide to Go® and Sani-Pen®! Wherever you go, be prepared with the CleanUp Kit. This clever combination pairs the stain fighting power of Tide to Go Instant Stain Remover with the germ-fighting, hand-cleansing features of the Sani-Pen® Clipless™ Hand Sanitizer Spray. Tide to Go is the #1 instant stain remover* and helps remove many stains including tea, coffee, wine, grape juice, ketchup, salsa, BBQ sauce, chocolate sauce and more. The Sani-Pen Clipless features the patented Twist-Lock Top™ for convenient one-hand use and is a must-have for on-the-go dining and travel. Sanitizer has 62% alcohol formula. This winning combination is perfect for dining out, picnics, travel and trade shows! Price includes 1-4 color process on white label. One set-up charge per kit: $70 (v). PMS matches are not exact, but are close approximates. 250 units/33 lbs per box. All alcohol product is sent via ground only and in compliance with HAZMAT regulations. Product is not returnable due to leakage or color change to fabric. Helps remove tea, coffee, wine, grape juice, ketchup, salsa, BBQ sauce, chocolate syrup, and more. Does not work well on grease, blood, ink. Economical sprayer features Twist-Lock Top™ for convenient one-hand use. Colorful Combo-Clip™ may be added. Quality medical grade tube. 62% alcohol formula. 0.5 fl oz. Proprietary formula includes Ethyl Alcohol and Hydrogen Peroxide, plus additional ingredients. Water, Dimethicone Copolyol, Aloe Barbadensis Leaf Juice. EYE IRRITANT. KEEP OUT OF REACH OF CHILDREN. In case of eye contact, rinse thoroughly with water. If irritation persists, seek medical advice. IMPORTANT: Before exposing treated area to sunlight, remove excess solution with damp cloth. Safe on most colorfast, machine washable, and dry cleanable fabrics. Some fabrics may be susceptible to color change. Test on hidden area prior to use.